"We Offer Commercial and Residential Gutters." Protect your foundation and other areas around your home with gutters installed by Drain Right Seamless Gutters, based in Rowlett, Texas. We fabricate and install custom seamless gutters; providing you with dependable, long-lasting gutters for your home. 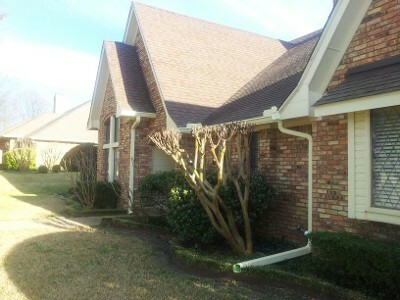 Drain Right Seamless Gutters creates customized, seamless gutters specifically designed for your home or business. From copper to half round styles and more than 30 different colors and materials to choose from, your gutters are guaranteed to provide your property with optimum protection. 5" Gutters- K-Style O.G- Designed for climates with light to heavy rainfall and/or traditional sized rooflines. 7" Gutters: Compliment many commercial projects. 2"x3" or 3"x4" Corrugated, 3" or 4" Round or Custom Square. In addition to traditional downspouts, we offer decorative rain chains in a variety of cups and styles. Please visit our gallery page for examples and call us for any questions you may have. Contact us for more information about our custom-fitted gutters for residential and commercial properties.